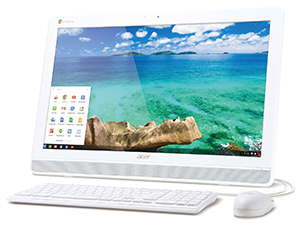 Acer is expanding its line of Chrome OS machines with two new all-in-one desktops. The Acer Chromebase DC221HQ series features two models, one with 10-point multitouch technology and one without. Equipped with a 21.5-inch 1080p HD display, the Chromebase line comes with a tiltable stand adjustable from 15 to 75 degrees; the machines can also be mounted to a VESA-compatible stand, bracket, arm or wall mount for use in public areas. Inside, an NVIDIA Tegra K1 quad-core processor and a 16 GB solid state drive provide the power to handle multitasking and heavy workloads — and to boot up in about 10 seconds. The Chrome OS supports multiple users and accounts, and backs up photos, videos, music and documents to a user's Google account. After signing into Chrome with a Google account, users are automatically signed into Google services. In addition to the Chromebase's pre-installed apps, more than 30,000 additional apps, themes and extensions are available on the Chrome Web Store. Complimentary 100 gigabytes of Google Drive storage for two years. MSRP for the Acer Chromebase is $429.99 for the multitouch screen model and $329.99 without multitouch. For more information, visit the Acer site.